Introducing the new Food Safety Card. Food safety credentials when you need them. Be prepared for when your local Health Inspector pays you a visit. Reassure your customers that you care about their health and safety. Display your Food Safety Decal and show customers and passers-by that your food workers are properly trained and serious about food safety. The course that gets accepted. The Official AIFS Food Safety Supervisor course is nationally recognised, ensuring that you meet all your food safety training legal obligations. Approved and accepted by every council in every state and for every industry. Don't risk your business, enrol today. AIFS is Australia's leading provider of food safety education and training. Each year we help thousands of Australian organisations protect their customers and maintain food safety compliance. As a Not for Profit Organisation dedicated to the promotion of better food safety practices within Australia, the Australian Institute of Food Safety Foundation has a mandate to educate the public. In addition to training, the AIFS Foundation helps to inform and educate the food industry and general public on the benefits of sound food safety practices. When you complete an official AIFS course, you comply with all state and federal legislation for food safety training. Most AIFS courses can be completed online in just a few hours and include complimentary AIFS membership. All food workers in Australia must abide by the Food Standards Code. Additional food safety laws and requirements are determined by food worker roles, sectors and states. Everyone who successfully completes our Food Safety Supervisor, Food Handler or NSW Recertification course receives a complimentary 2 year membership with AIFS. Membership inclusions can protect and benefit you, your business and your customers. AIFS membership provides you with access to numerous food safety resources including food recalls, posters, templates, guides, webinars and more. 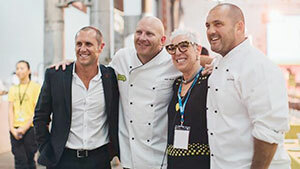 The AIFS Foundation tackles food-related issues throughout Australia. Our team are dedicated to reducing the number of people with food-borne illnesses and helping the vulnerable in our community who suffer from hunger. We believe that educating food workers and the general public is key to reducing the number of food-borne illness incidents in Australia. That's why we provide hundreds of free resources and promote food safety through the media and other channels. For every Food Safety Supervisor course enrolment, we'll help to feed two people in need in partnership with OzHarvest. For every Food Handler enrolment, we'll help to feed one person. Our team work closely with OzHarvest and volunteer regularly to help collect, prepare and distribute food to vulnerable people in our community. Our mission is to reduce food-borne illness in Australia. To help achieve this goal, we provide access to hundreds of free food safety resources for food workers and the general public.